Recovery begins on the day of surgery when you wake up in the recovery room. Find out what it’s like and what they do to you when you wake up from the anesthesia after surgery. This is what happens after a tummy tuck! The following timeline shows a typical healing after tummy tuck (abdominoplasty) surgery. 0-4 days Some discomfort, swelling and pain (controlled with medication). Get lots of bed rest. 5-7 days Stitches removed, surgical drains removed. 1 week Begin light exercise. 1-2 weeks Back to work for desk job. 2-6 weeks Most of the swelling will be gone. 3-4 weeks Start moderate exercise. 3-6 weeks Begin feeling normal. 6 weeks Back to work for strenuous job. 1-2 months Scars start fading. 1 year Scars mostly faded. I awoke to find that I actually felt pretty good. I had no pain and I was clear headed, but I found that my blood pressure was low and my pulse was high. I had to move very slowly and take great care about getting into and out of bed. My home health care nurse (Donna) insisted on helping me walk from the bed to the living room chair (just to be on the safe side). Sitting in chair the morning after my tummy tuck. She made some oatmeal for me to eat. It was tasteless and dry. I discovered later that my taste buds were effected by the anesthesia. Food did not taste good for about one week following the operation. Also, I did notice that I felt fuller faster. I attribute that to the tightened belly skin and the compression garment that I was wearing. Donna left at 11:30 am. I weighed myself on the scale to try to determine how much “skin weight” was removed. I was surprised. Instead of showing a weight loss, the scale indicated that I had gained 4 lbs. 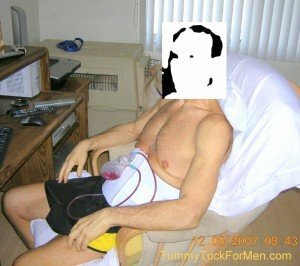 I assumed this increase of weight to be a retention of all of the fluids they pumped into me during the operation as well my morning breakfast. 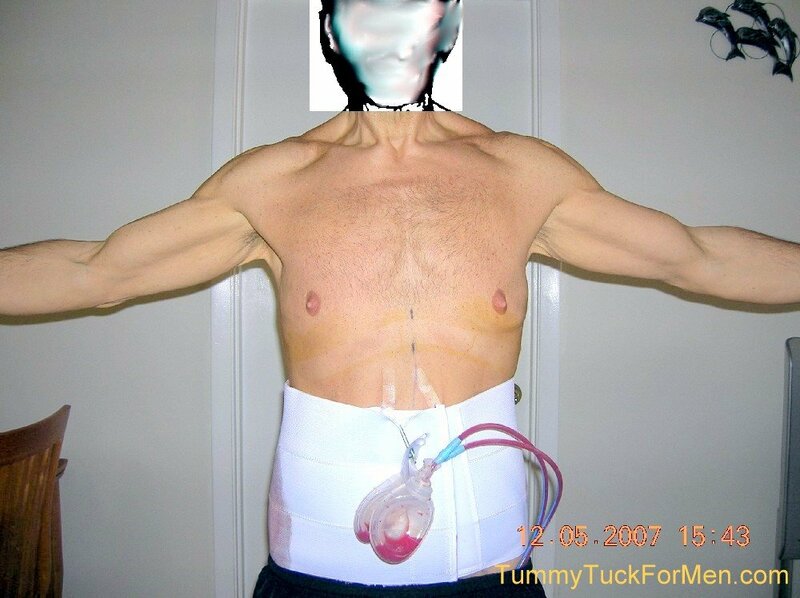 I was also wearing a large heavy elastic compression garment around my midsection. Skin weight loss could not be determined. The rest of the day was uneventful. First Follow-Up Visit – 3 days after my tummy tuck surgery I went to the plastic surgeons office to check up on me and my surgical drains. I had to take a taxi to and from the doctor’s office because I was not allowed to drive for two weeks. The drains were functioning well according to the doctor. I informed him that I had no pain at all, just a numb or “tight feeling” like there was a band around my stomach and waist. He was surprised and pleased that I had no pain. Note – This was the first of five follow-up visits that I had with my plastic surgeon. I never thought I would have to go back to him five times but that was a normal routine for him. He did a good job in checking up on me. Second Follow-Up Visit – Almost one week after my tummy tuck I went to the doctor again for my second follow-up visit. He removed my surgical drains. Sutures looked good. I informed him again that I had no pain, just numbness around the waist. 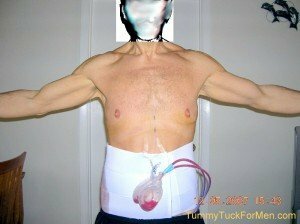 When the doctor pulled out the drains he simply held my skin at the point of connection then simply pulled out the plastic tubing. They both slipped out nicely with no pain or discomfort. Here are some recovery tips to help you with your tummy tuck journey. Wear your compression garment – all the time. Follow you doctors post operation instructions – all the time. Get up and walk as soon as you can to speed your recovery and reduce the chance of clotting. Don’t lie or fudge on your surgical drain measurements in the hope of getting them removed faster. Surgical drains that are taken out too soon may have to be put back in again (new drains that is). Buy some age bandages that are large enough to go around you waist. You can use them to hold the bandages on after tummy tuck surgery and keep you compression garment clean. After surgery don’t expect to jump on the scale and see how much weight in skin was removed. If you do you will find that you actually gained weight from all the fluid retention and swelling that you have. After you have your tummy tuck, if you eat a large meal you will feel full faster. I cheated and drove before I should have. I drove one week earlier than the 2 week restricted timeframe allowed. But I craved a treat and wanted to get out of the house. A treat for me was a mixture of Low Fat Borden Vanilla Yogurt (300 calories per large tub) and a can of Fat Free Whipped Cream (200 calories per can). I went to Publix and wore an ace bandage beneath my shirt and long pants. Driving to supermarket was uneventful but only took 5 minutes. I used extreme care getting into and out of the car. Walking up and down the aisles was no problem except that I was getting a little nervous and a little shaky. This was due in part to my having to hold up pants with my left hand to keep them from falling down. My pants were slightly too big and I could not tighten my belt because of my stitches at my waste. This was a big problem at this point in time. I was also starting to get tired. I seemed to tire easily since the surgery. Made it to the checkout counter with no major mishap. My hand was pretty shaky when I signed the Amex slip to pay. I felt relief when I got back into the privacy of my car. Noticed that my shirt tail was beginning to pull out of my back and my lowest front shirt button came undone. Hope that occurred as I entered the car. Drove home no problem. I Pigged Out! As well as buying the yogurt and the whipped cream as treats I also bought two other “treat” items. Some no fat cottage cheese and rice cakes. After eating these my stomach hurt a little ( felt like bursting from the inside). I didn’t really eat that much. Have to get used to the tightened skin (I still had the compression bandage on too). I exercised with light dumbbell weights (15 lbs. weights) and various stretches for 1 hour. I think I was suppose to wait a few weeks after a Tummy Tuck before exercising but I was feeling very good. I took great care to avoid any pulling on the mid-section area and on my stitches. Does Exercise Help Recovery After Tummy Tuck Surgery? Exercise is plays a very important role in recovering from tummy tuck surgery. It reduces the amount of swelling you have, reduces the chance of a blood clot forming and provides muscle tone in your newly contoured tummy. Of course, as they say, you should exercise per your doctors instructions, starting slowly at first and gradually increasing the vigorousness of your exercise with regard to your condition. To assist my pants in staying up and to better protect my stitches I wore the smaller ace bandage low on my hips up to and covering the stitches. In doing this my pants will fit tighter and I won’t have to cinch my belt as much. It worked except that by the time I got home it felt a little too tight and was a relief when I got it off. I woke up feeling fairly normal. No noticeable bloated of numb feeling in tummy area while lying in bed. Slept with ace bandage as well as the compression garment. Why Elevate My Legs When Sleeping After A Tummy Tuck? Almost all patients can expect some swelling after surgery. Sleeping after a tummy tuck on your back while keeping the legs elevated for the first few days will help with proper blood circulation, minimize swelling and prevent edema (excessive fluid accumulation). Two or three pillows under the legs offers sufficient elevation after a tummy tuck operation. (Some plastic surgeons recommend that you sleep in a sitting position for the first week after tummy tuck surgery to prevent stretching of the newly tightened abdomen). Early in the morning a little more than 2 weeks after my tummy tuck. Weight: 156 lbs. Finally made it back to my weight the day of surgery. Maybe this means some of my swelling has gone down because I know I did not lose any weight by dieting since the surgery. I think I can see a difference in swelling since the surgery. I think I look a little slimmer. Third Follow-Up Visit – Had 10:00 am appointment with the plastic surgeon to have my stitches removed (to see my stitches you have to click on the link and zoom in for a close up view). The degradable stitches have been dissolving and falling off during the previous week and are mostly all gone now. Today the doctor will remove the belly button stitches and well as the few “permanent type” stitches from around the waist. Stitches Removed. While I was standing, the doctor removed the stitches from my back and sides. He then instructed me to lie down onto he table (face up) where he continued to remove the stitches on my abdomen and belly button area. Approximately 15 stitches were removed. Tummy Tuck Recovery Fluid Buildup – The doctor noticed that it looked like I had some fluid retention or drainage in my midsection (seroma) and decided to drain it. He inserted a “big needle” just below my belly button and drained (sucked out) about ½ cup of red drainage fluid from my belly area. He told me not to look, and I told him I did not want to but I wanted to see the needle and how much it contained after he was done. I was surprised to see so much drainage was still inside me. He said that it was not uncommon and that by draining it the way he did saves my body the trouble of absorbing it and aids in the healing process. Note: When he first brought out the big needle (syringe) needless to say I was a little apprehensive, but because my belly area was still numb I didn’t feel a thing. For my third follow-up visit I had prepared some questions for the doctor that I wanted to ask him during this visit. When can I resume taking Ecotrin each day? I can start today. The fingers in my right hand have no strength. I can barely hold a pen. I don’t think so, but is there any connection with having the operation? – Probably not. The body is in a weakened condition. (This turned out to be unrelated nerve damage). Anything I should be doing to reduce scarring? – He will tell me at my next visit. 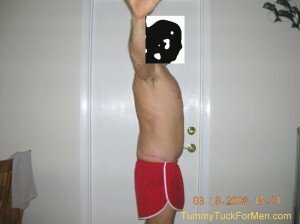 Is the belly protrusion caused by swelling? – Some of it is. Can’t tell how much. Why the uneven surgical “cut line” (incision) in the back? – The body is uneven. Different amounts of skin are cut off on each side to look good. Diet now to lose a few more pounds or wait and let my body heal first before continuing diet? – Let body heal first is probably a good idea. How long should I continue to sleep with my head and legs elevated? – He asked me if I had any bloating in my legs. I said no. He said then I can stop elevating my legs now. I wear the big white support garment (compression garment) almost full time to inadvertently avoid pulling at the stitches. How much longer do you recommend wearing it? – He said that was very good that I was still wearing it and to continue for a while. When can I safely stretch the “stitches area”? – Not for a while. Before the surgeon left the room I commented to him that to me it looked like he did an excellent job and to compliment his staff on their professionalism and that they were friendly and courteous throughout the entire process. He thanked me for the compliment. I was scheduled to return in one week, December 27, I think to take post-operative pictures. I assume I will receive follow-up and post-operation instructions including scar reduction techniques at that time. Following the appointment I went grocery shopping at Publix. I walked slowly and did fine. In the afternoon I took more tummy tuck recovery photographs to document the “day the stitches were removed”. 1 hour of exercise. Still using the lower 15 lb. weights. Went to family doctor to have him take blood pressure readings over time to show that I have white coat hypertension and that my real blood pressure is normal. It worked. After numerous readings and passage of time between each reading my BP made it down to 132/73 with pulse 69. Still higher that it is at home but good enough to fall into the normal category. I did this for health insurance purposes (I was applying for new and cheaper health insurance). This time when I went out I wore shorts and a Polo shirt for comfort to better aid my lowering of blood pressure (feeling more comfortable). Shorts don’t fall down as easily as long pants. Driving and travel is a lot more comfortable in shorts. Removed bandages and compression garment and noticed the swelling had gone down considerably. Hope it continues. Seems that my stomach area is becoming less numb and I think I have more feeling there and it seems to be more tender. Still healing quite well though. I am impressed with how fast the stitches have healed and how the skin is coming together nicely. Doesn’t look too bad now. Stomach seems flatter today in the mirror. Went to Publix wearing long pants. This time I wore the ace bandage lower on my hips as an aid to keep my pants up. It worked. I wore the pants up higher and they stayed up the whole time. Exercised 1 hour using the 25 lb. weights for the second day. It was a little bit easier today than yesterday. I tried doing push-ups again today. I can do 15 with no problem. Before the operation I could do 30. These muscles must still be very weak. When I was rubbing my stomach I observed that the numbness is starting to fade and is being replaced by tenderness and more feeling. I take this as a good sign of recovery. The last 3 temporary stitches came out by themselves as I applied ointment to the area. Now I have no more stitches in me. I am “stitch less”. Looking back, I attribute my speedy recovery and “no pain” throughout the entire process to my being in good condition before the procedure as a result of the supplements that I took, the daily exercises (weights and swimming – over 2 hours worth per day) and eating only healthy foods. Three weeks after my tummy tuck surgery. Each day I apply new antibiotic ointment, Neosporin, to my stitches. Since they are almost fully healed, I save money by covering them with loops of toilet paper before applying the ace bandage. Using store bandages got expensive and was providing no useful value as infection was not so much a concern anymore since there were no current wound openings. On top of the ace I still used the compression garment. I basically only use that to remind me to limit my movements and I read somewhere it aided in the reduction of swelling. Fourth Follow-Up Visit – 2:45pm appointment with plastic surgeon, presumably for “After” pictures. I was wrong. No after pictures taken. Just another post-operation checkup. Everything looked fine. Doctor examined me to see if there was anymore drain fluid buildup in my stomach area. He wasn’t sure so he stuck another drain needle into my belly, fished around for a pocket of fluid, but came up “dry”. I take that as good news in that I did not have anymore waste or drainage fluid in my belly. Needle did not hurt at all. Made another post-operation appointment in 6 weeks. Still wearing compression garment all the time. Adding new antibiotic ointment every day. About one month after my tummy tuck I finally took off my compression garment. Only wear it for exercising and sleeping at night. Noticed that my “lower parts” are returning to normal with regards to swelling. A few weeks after the operation my lower parts grew bigger and noticeably larger. Before the procedure the nurse told me that sometimes the scrotum area becomes enlarged due to draining fluids and gravity. It seems as though she was correct. Today it looks like they are back to normal. Some feeling is returning to my tummy area but it still feels like I am wearing a band around my waist all the time, especially when I have a full stomach. I think I have gained a few lbs. over the holidays. A few lbs. shows up more noticeably in my belly area now. Current weight is about 160 lbs. I have to start thinking about getting that down to about 147 lbs. which I think is my ideal target weight. 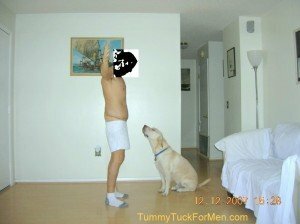 Took photos of myself in pushup position to compare to pre-operation pushup photos. At consultation with the doctor I mentioned I had weakness in my right hand fingers and the inability to do fingertip pushups. He referred me to a neurologist. Note: I subsequently went to a neurologist, then after that a neurosurgeon regarding the weakness in my right hand and both of them indicated that this was not a result of my Tummy Tuck operation. However, I am not totally convinced that it is not related somehow. The timing is too coincidental. I took tummy tuck after pictures to document the tummy tuck healing process. I especially wanted to photograph the swelling and scarring associated with my tummy tuck and body lift. Final visit with the plastic surgeon. Four months after my tummy tuck surgery I went for my fifth and final visit with my surgeon. He said everything looked good and there was no more reason for further visits. I took tummy tuck recovery photographs to document the healing process involved with tummy tuck and body lift operation. Tummy Tuck Recovery Pictures can be seen here. My Tummy Tuck surgical experience and recovery was PAIN FREE. Too bad it cost so much and was NOT COVERED BY INSURANCE. I am satisfied with my tummy tuck results (my belly overhang is gone). It was an interesting experience to live through. Now the hard part begins, not to gain any weight back. To read all Tummy Tuck Feedback click here. If you have any tummy tuck recovery stories to share please use the above form. Thanks for the great story. I’m wondering, how long was it before you could wear your pants after surgery ? With the swelling, did you go up a size or wear sweat pants? Thanks. I was able to wear long pants one week after surgery. No sweat pants, just plain old jeans. I can’t really remember, but I believe they were the same jeans I wore the weeks prior to my surgery. I did have a large assortment of pants in my closet (all sizes) from my “fat days” to choose from, so finding a pair that fit wasn’t a problem. My excess skin and weight that I lost was mostly above the waist line (and I always wore pants fairly low). Most of the swelling from surgery was above the waist so it was not a problem as far as wearing pants was concerned. I did have to wear the bandages and the compression garment under the pants which added some girth but not too much. Here is an excerpt take from my website about the first time I wore pants. Thank you so much for making this website. I have looked all over the internet for information (secondary to asking my surgeon) but this first-hand information from a patient’s perspective is exactly what I needed. I especially appreciate the pictures detailing your healing process. I have my surgery in about 10 days, and I am really glad I stumbled upon your site. I will definitely revisit before and after my operation. Thanks again. Let me know if you have any questions or if I forgot to include something on the website that would be of interest. Good luck with your operation. I had a tummy tuck, lower face lift, chin reduction and eyes bags done and lip implants all in one day. I had drain from the lower part of the facelift and drains from the tummytuck. After, surgery my face was super bruised and swelled. My stomach was swelled. I never had any pain, but just a little discomfort from the drains in my tummy. The second the drains were removed from my head. doctor was amazed how I had no swelling anywhere in my face. On the 4th day after surgery the drains of my stomach were removed and the stitches from the top or eye lids. On the 10th day after the surgeries the stitches in front of my ears where removed and the staple behind the ears where removes. The stitches from my lips they fall out on there own as well as the one inside my mouth for the chin reduction. That took about 10 days. The lower eye lid took longer to fall. I need to go back to remove the stitch from behind the ear. and the stitches from the tummy tuck will also fall out on there own. I am on day 12 since I had the surgery. I feel great with no pain. just a few bruising on the neck and side by the ear. I applied for care credit through the doctors office. The more you get done at one time the more discount you receive. Strax In Boca or in Ft. Lauderdale Florida. They have 15 doctors. Three years ago I also had liposuction and breast with the care credit card. You can not beat the there prices. I believe it is the best around in Florida. Wow! I thought I had a lot done to me but you win. I can’t imagine doing that all in one day. I am glad to hear about someone else who had no pain from their surgery. Out of curiosity, I also looked up Strax Rejuvenation® in South Florida. It looks like they do just about any type of plastics surgery anyone might need. I had surgery on March 25 and the brittle ones are tender to touch sometimes and when they rub against something I am wearing it pulls a little bit. I think I will call my regular doctor about having them looked at to make sure they are okay or need to come out. My incision is healing pretty good…except one or two areas that just look irritated, but I have been putting some 1st aid cream on them and it seems to help. I just wish the swelling would go away…it is starting to annoy me…! LOL Not sure if it needs to be drained a bit, but the thing I am worried about is my insurance would not cover any after care. I know the doctor in INDIA said there would be aftercare, but it has been 6 days since I sent a email and he has not responded. I appreciate all your help. Response – 3 weeks after surgery (and much longer), every day I would shower, dry, apply petroleum jelly to the stitch area, cover with a bandage or paper towel, then wear the compression garment on top of it. Sounds like you are not wearing a bandage or compression garment if you are experiencing pinching with clothing. Sounds a little early for that. I do remember some stitches being “tender to the touch” before putting on the bandage and the compression garment. I never experienced the pinching. I also remember a couple of areas that stayed “red” longer than other areas. Be patient with the swelling. For me it took a long time to go away. I think even if you did not have your concerns with the stitches it’s a good idea to have a follow-up with your local doctor. I think I had four or five follow-up visits with mine. I know it’s hard to spend the money but it may be worth it just for the piece of mind (and may prevent further complications from arising). For me, not knowing and worrying about something is worse than physical pain or discomfort. I found it very helpful to read on your recovery. I have a question about the stitches because I had my surgery in INDIA at Wockhardt Hospital which came out very well. I had a great doctor plus it saved me a lot of money. My stitches at the hips are hard n brittle just wondering if they need to be removed by my primary doctor in the USA? I know you are not a doctor, but wanted to ask. He said the ones in the middle of my tummy would just fall off. I am just worried about the ones on my hips. Thanks in advance. From what I remember, the “brittle” stitches that I had turned out to be the non-permanent dissolvable stitches. It took about 2-1/2 weeks after surgery for them to all fall out. When I showered and gently rubbed the stitched area with a bar of soap, little pieces of stitches (about 1/4″ long) or so would sometimes break off and cling to the bar of soap. Over time, they eventually all came out. I carefully removed a few of the stubborn fragments with my fingernail or a tweezers after observing that the skin was healed and they were no longer serving their function (they were just sticking out). – how long has it been since you had your surgery? – have your permanent stitches already been removed? – has your skin healed together so that the remaining stitches are not performing any function? – are the ‘brittle” stitches that you refer to complete stitches or fragments of stitches? – did you have all of the permanent stitches removed when you were still in India? What did he say about the hip stitches? Do they look the same as the tummy stitches? Have you noticed any other dissolvable stitches coming out by themselves? If not, then maybe enough time has not passed for them to dissolve and break down. If other stitches have “dissolved” but the ones on your hips remain one or two weeks after the others have gone, maybe they will have to be removed. But, if they told you that the hip stitches were dissolvable and if they are not causing you any pain or discomfort, you may want to just give it some more time. Your local doctor can always remove them later.